You can insert a new element feature directly on a diagram, using in-place editing. In Enterprise Architect, open the diagram containing the element. 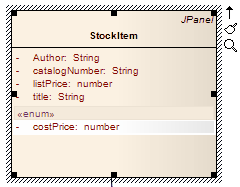 Click on the element and, within the element, on the item after which to insert the operation or attribute. Enterprise Architect inserts a new data line in the diagram, underneath the selected item. Type in the relevant information for the attribute or operation. Press the Enter key to accept the change or Esc to cancel the change. The diagram is updated to reflect the changes.